The cover says “with interruptions by Sue Perryman” but those a few and far between. There’s a chapter or two and a handful of interruptions in the book. Which is part of the problem with the book. The promise of the shared journey of the title is drowned by Neil’s solo experience. Now there’s nothing wrong with Neil’s solo experience. It’s an interesting story itself. A honest, open story of growing up a nerd before it was cool with all the ongoing hints of the damage that caused. It’s heartfelt and familiar to me, and I’m sure anyone who had an obsession growing up, but essentially empty. It’s just the story of another fan. Interesting, funny but well, eh. 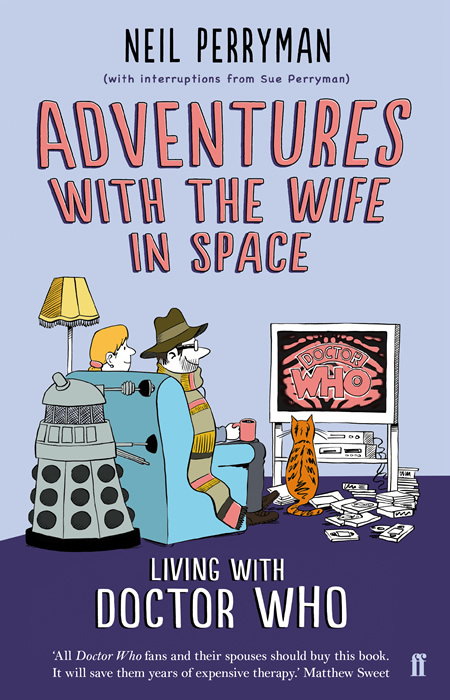 The addition of the best of Sue’s comments from the blog regarding the episodes that he watched as a growing up is a nice juxtaposition, but it doesn’t quite feel like “Adventures with the Wife” at all. It’s only the last third that really looks at the shared experience, looking a a blog Neil did about his wife. The beauty of the blog, as Neil points out, is that there are blogs and reviews of classic Who by classic Who fans with really not much to say that hasn’t been said a hundred times before. Which is what most of this book feels like. The book needs the Neil stuff for context, but there just seems too much of it and an undercurrent of a plea to be understood and accepted. And then the blog stuff ends up seeming rushed and really just supporting the pre-existing website. The description of the viewings end with Neil and Sue struggling with the idea that this big shared experience was about to end and Neil throws a few more things into the mix to try to recreate the fan experience for Sue. But these things he covered earlier and so only touches on here leaving the book endingless. It does almost save the ending with them experiencing the series 7 final, but the cliffhanger ending of that leading into the anniversary leaves the book (which it mentions will be released about that time) equally feeling up in the air. Beyond comments from the blog, the book is mostly chronological, but Neil groups experiences and stories so the chapters have a narrative theme – he’ll talk about the few conventions he’s been to, jumping back a decade from the previous chapter and forward a few years, leaving one disconnected from the flow of the story and struggling to remember the context of the time. Despite all the problems with flow and unfulfilled potential, I absolutely devoured this book. As a fan of Doctor Who, new and old, and of many other shows especially SF shows, Neil’s story was a familiar one (we even inhabited rec.arts.drwho over similar periods, but a quick search suggests we never interacted). A shared experience that made this a book I really enjoyed reading and one I’d recommend to any long term lover of geeky things. Thanks to Gillian Langtree of Antiheroes-R-Us for giving me the book.